These stories are the final parts of a four-part series about our Halfsy Heroes, Tonya O’Neel, Robert Rieck, Korey Donahoo, and Susan Swearer. Our series followed our heroes as they trained for the 2017 Good Life Halfsy. As Tonya O’Neel suffered from a case of the flu, she debated a trip to the emergency room and wondered if her year of training was for absolutely nothing. She muscled her way through the worst of the illness and even managed a kickboxing class and one more run over the bridge the Friday before the Halfsy on Sunday. Her friends and family had all been assigned specific mile markers so she would know who to look for without having to slow down. But after her nephew was behind her, the fatigue started to set in. Around mile 11, Tonya started to lose her focus. 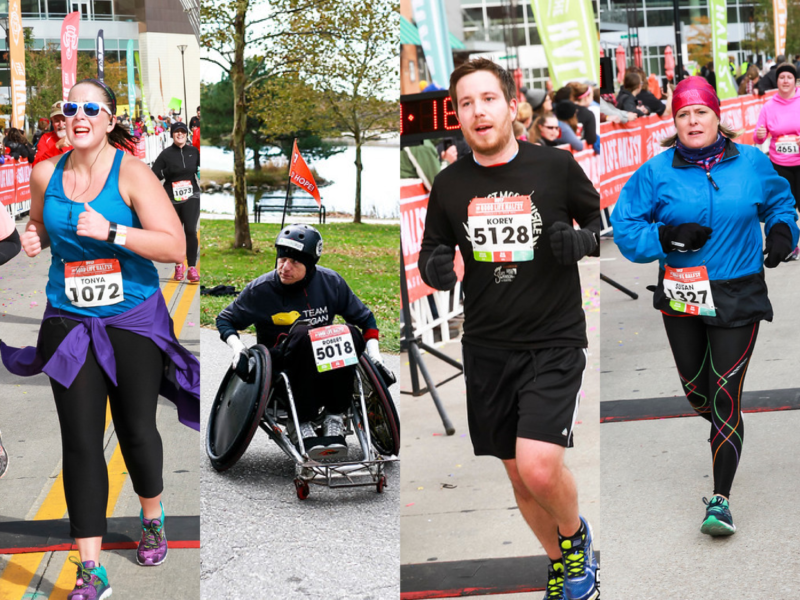 Tonya knew that as her body slowed itself down and the exhaustion set in, her goal of finishing the race in 2:30 was slipping through her fingers. After running hundreds of miles over months to prepare, the moment had come, and gone, in less than two and a half hours. After her race, she had planned to just go home and rest, and even took the next day off work to recover, but life had other plans. And when the decidedly non-runner was asked if she wanted to continue her racing career, she felt no uncertainty. As Robert Rieck raced to assemble his heavy chair, he heard the call to start. This wasn’t Robert’s first Halfsy, but it was his first race since his chair had been modified. Robert had his chair adjusted before the race but hadn’t had a chance to assess how the modifications would affect his time. And then his tires malfunctioned. And with these mechanical errors piling up, Robert felt the drops of rain on his face. His family had all been on high alert and were messaging about the rain. But he dug deep and decided to push for as long as he could. The sprinkles dissipated and weren’t enough to register as a rain. They were just enough to fuel Robert to push through them, and whatever other malfunctions this day could throw at him. And as Robert pushed harder to overcome his setbacks, he pushed himself to a personal best time. After months of setting goals, Korey Donahoo was ready to put his feet where his mouth is. As usual. Between his family, and the members of his team from The American Outlaws, Korey had a lot of people to impress, and he didn’t fail them. And the sore legs he felt the next day weren’t enough to spark an ounce of regret. Korey’s journey from spectator to respectable-paced racer (He finished in 2:07!) came with its fair share of aches and pains, but the perseverance he gained was enough to propel him off of the sidelines and over the finish line. In the years, months, and weeks leading up to the 2017 Good Life Halfsy, Susan Swearer had to face obstacle after obstacle. From a nearly catastrophic injury which cost her over a year of recovery, pneumonia, and rehabilitation, to the heavy rains that put a damper on her training, she wasn’t going to let nature, fate, or even her own body come between her and her finish line. And that support has helped Susan overcome so much in the last couple of years. While she expected a huge emotional moment as she crossed the finish line, what she felt instead was an exchange. While she was leaving 2 years of trauma, pain, and setbacks behind her, she was walking into the realization of just how capable she is. Instead of a moment of completion, she experienced a moment of a new beginning. We can’t wait to see what else Susan is capable of, and can’t wait to have her back next year! Check back for next year’s Halfsy Hero stories, or go back and read the previous installments of our 2017 heroes stories.